I can vouch that there is more to the Volvo V90 Cross Country than rugged good looks. Venturing up a slippery, rutted track made of boggy mud and loose gravel, the car lives up to its name, crossing this particularly piece of countryside with the determination of a terrier after a tennis ball. While today’s popular crossovers combine beefy off-road looks with ordinary front-wheel-drive, and therefore risk getting stranded in a damp overflow car park, the V90 Cross Country is effectively the opposite – a quite capable 4x4 without the lardy bulk of an SUV body shape. 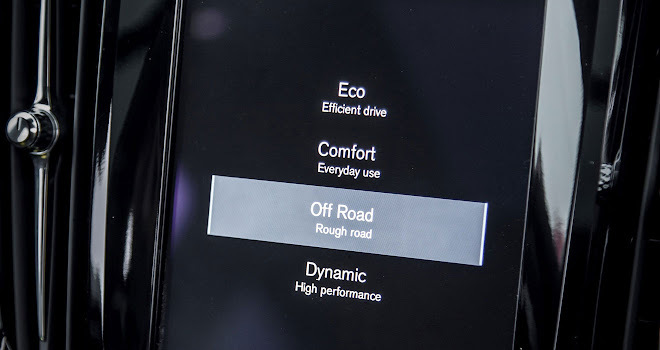 Drive off the tarmac and you can select a dedicated Off Road mode, using an eye-catching little diamond-cut thumbwheel on the V90’s centre console. The car’s all-wheel-drive and electronic systems will then do a remarkable job of hauling Volvo’s smart wagon over the rough stuff. There’s a reassuring hill-descent control to take charge on slippery downward slopes, and a very effective off-road hill-start system to take the terror out of setting off when yards from a mountain precipice. You can also call up a view through the car’s nose camera when cresting ridges (assuming you’ve spent £700 on surround cameras or added an option pack that includes them). Cameras are a godsend off-road, especially when the windscreen is full of sky and you can’t recall if the trail goes left or right when you get to the top. And as you plug through the mud you’ll remain cocooned in the wholesome Scandinavian luxury that is the hallmark of Volvo’s latest generation of cars. 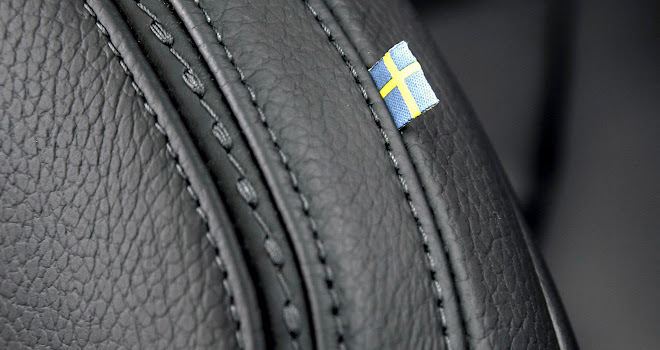 Neatly stitched leather, gleaming chrome highlights, tastefully finished wood, and little Swedish flags sewn into the seams of the upholstery all remind you that you’re sitting in something special. Among the downsides, the V90 Cross Country is of course a bit smaller than its big brother, with no seven-seat option. 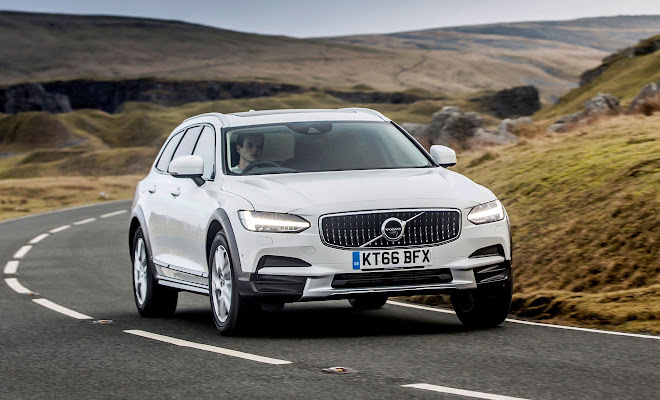 And while ride height has been raised by 6.5cm compared to the standard V90 estate, the Cross Country’s long chin will still scrape the ground if the off-road approach angle exceeds 19 degrees – the XC90 and, say, Fiat’s eager little Panda Cross can both square up to 24° slopes. But the V90 Cross Country does a better job than any SUV on tarmac. Stick to the black stuff and it feels perfectly at home. Tall 235/55 all-weather tyres on 18-inch alloys add a bit of extra softness to the V90’s already refined ride, while the extra height feels handy when threading through traffic. 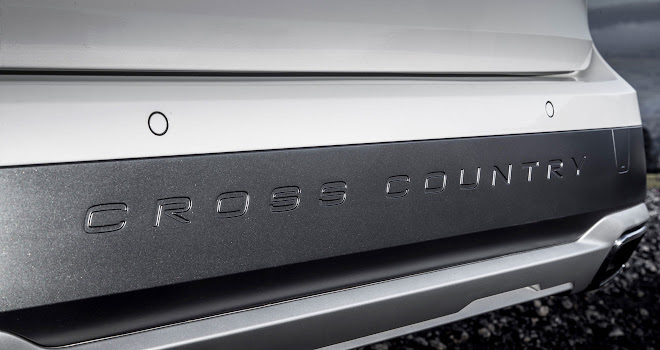 Brisk cornering isn’t a V90’s star turn, it will lean and squirm when pressed, and the Cross Country edition adds a dash of extra uncertainty to the steering. Sailing unruffled over lumps and bumps is more the Cross Country’s party piece. Air suspension is a £950 option and applies to the rear axle only – its primary job is to level the car when towing or carrying heavy loads, not to provide a better ride. Alternatively, for £1,500 you can specify air springs at the rear plus active dampers all round, allowing the car to respond more fully to “Comfort” or “Dynamic” mode selections. There is also an “Eco” option. 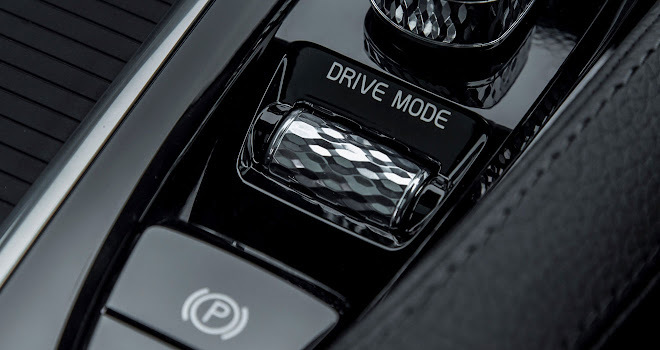 In Eco setting the Cross Country’s automatic gearbox will allow the car to coast on its own momentum when you lift off the throttle, which can be surprising if you’re not expecting it. Helpfully the optional digital instrument panel will adjust its dials as you switch modes, to keep you better informed about what’s going on. Naturally the car won’t coast when set to Off Road mode, and equally it won’t stay in Off Road guise above 25mph. Reach that speed and the car will switch quietly into its Comfort setting. Various safety and guidance technologies fitted as standard to the V90 estate are also offered with the Cross Country edition, including the slightly unnerving Pilot Assist system, which will self-steer the car to keep it in lane on dual-carriageways (up to 80mph and for as long as you keep your hands on the wheel). 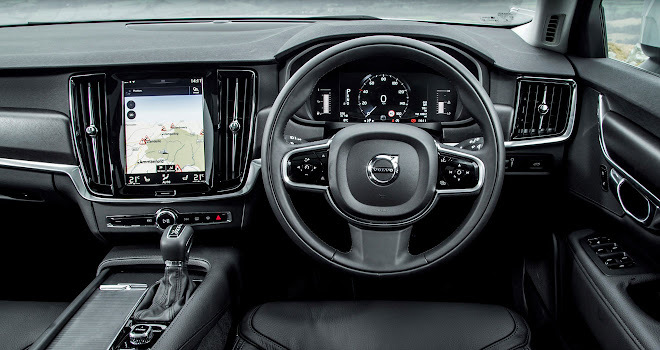 Indeed most of the interior carries over from the V90, including the nine-inch portrait-format touchscreen. This is bright to look at and simple to use, though it does take a long while to boot up (which can leave you drumming your fingers waiting to feed in a satnav destination). 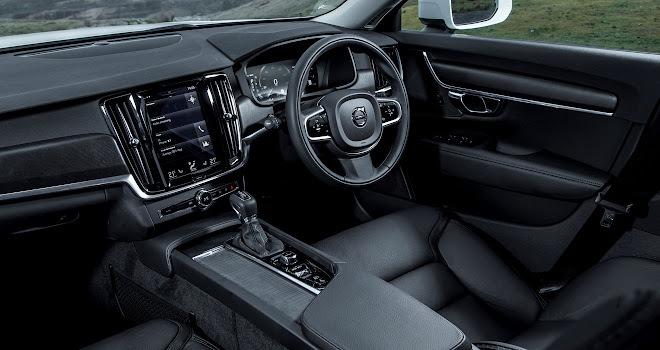 It can also feel annoying that there’s no dedicated knob to adjust the cabin ventilation – you have to look away from the road to accurately prod the touchscreen if you’re too hot or too cold, which surely runs counter to Volvo’s safety-first ethic. A quick twist of a dial would be preferable on more than one level. 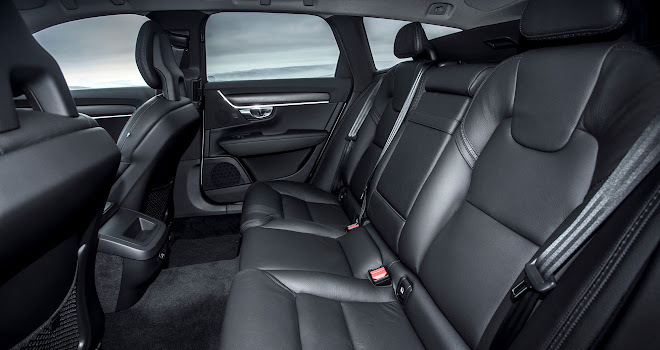 The rear cabin provides lots of legroom for adults, while an optional £450 Family pack adds rear blinds, power child locks and two-stage booster seats integrated into the two outermost rear seats. 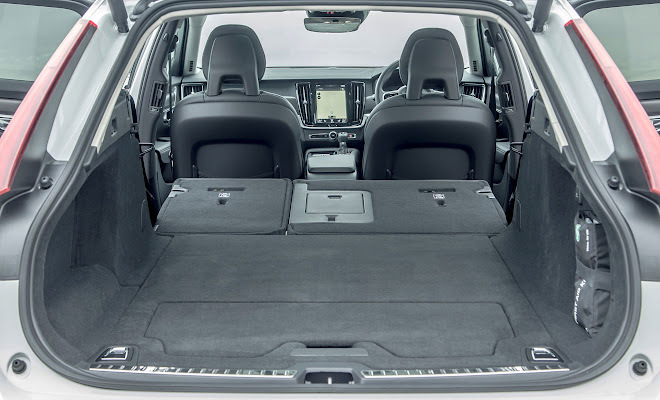 The boot is sensibly large and square, the rear seats can be flopped flat while you stand at the back, and a space-saver spare comes as standard. There’s a choice of two engines in the UK at present – a D4 turbodiesel rated at 190 horsepower and 400Nm of torque, or a D5 turbodiesel boasting 235hp and 485Nm. The D5 engine also includes Volvo’s PowerPulse technology, which uses compressed air to help spin the turbo up more quickly to boost initial acceleration. As a result the D5 can sprint to 62mph in 7.5 seconds compared to the D4’s 8.8 seconds. At heart, however, the two engines are the same 1,969cc four-cylinder unit, which helps to explain how they produce such similar results when tested for economy. The D4 has a CO2 rating of 138g/km, while the D5 is only a smidgen worse at 139g/km. Both editions use the same 8-speed auto gearbox and four-wheel-drive system. You will pay more for the extra power, naturally. 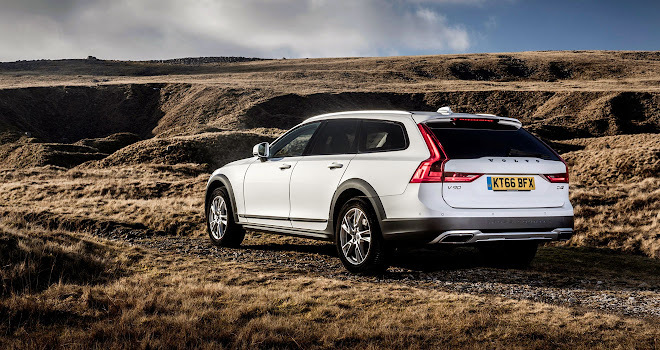 The D5 edition of the V90 Cross Country costs £3,800 more than the D4, starting at £43,585. Official combined-cycle fuel consumption is in the mid-50s for both variants, while my relatively brief sampling on British roads suggests high 40s can achieved easily, as long as you stay out of Dynamic mode. 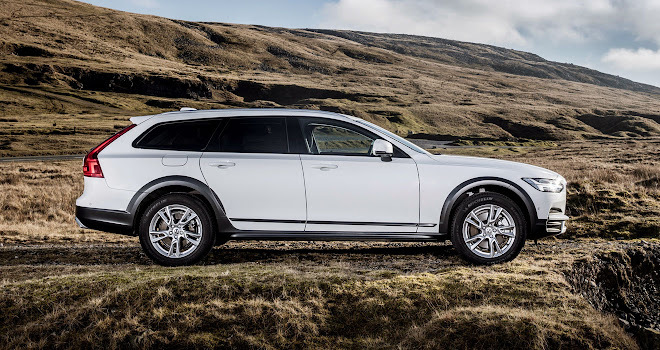 Alas, there is no plug-in hybrid edition of the V90 Cross Country on the horizon. The standard V90 estate is due to appear in a four-wheel-drive, T8 Twin Engine variant later this year, and while there’s no technical reason why there shouldn’t be a T8 Cross Country, it’s not currently pencilled into Volvo’s roadmap. That’s a surprising decision when you consider that Volvo initially expected the T8 powertrain to account for only one in 10 sales of its XC90 SUV, but actual sales in the UK are running closer to one in four. Perhaps Volvo will reconsider and put a plug-in V90 Cross Country on sale at some point. That really would be a car for all reasons.